Shattered glass from once sturdy-looking windows line the floor, riot police are everywhere, and 200 protesters scream of injustices in the Middle East. Pepper spray is unleashed, entering the ventilation system, engulfing ticket holders and protesters alike. Everyone in and around Concordia’s Henry F. Hall building are forced to flee. This was the scene at Concordia on Sept. 9, 2002, when Benjamin Netanyahu, the current Prime Minister of Israel, prepared to deliver a speech that was later cancelled. 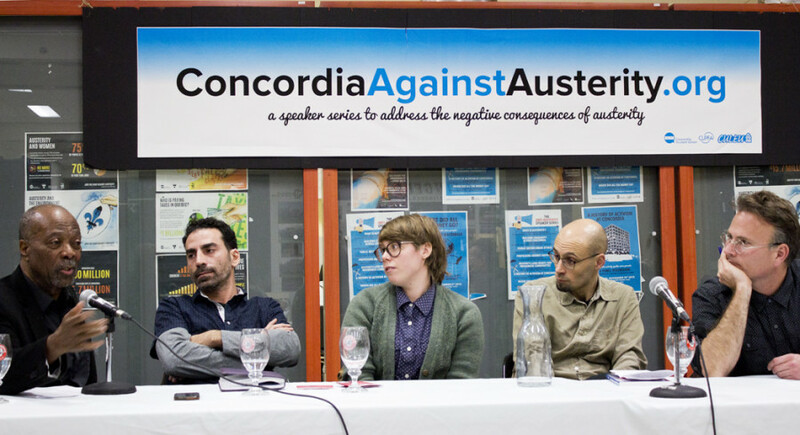 On Nov. 19, as part of the university’s Anti-Austerity Speaker Series, a panel of activists reminded students that this momentous day—along with other protests and disruptions—have long been a part of this university. “The more things change, the more they remain the same and the fight against oppression will continue,” said panellist Rodney John. Panellists included Yves Engler, Alex Matak, David Bernans, Robert Green, Rodney John, and Laith Marouf, each of whom shared stories of resistance at Concordia. The recounts spanned from tales of protests over racism in the 60’s—known as the Computer Riots—to the 2012 student strike over tuition increases. Matak, a former Concordia student, blocked classes during the student strike with varying degrees of success. “The strike was an intense and complex time, and it was also my entire life at the time. I had the privilege of not having a lot of other ties in the world then, so I could engage with it fully. And I did,” said Matak during the panel. Some applauded Matak’s radical approach to challenging the powers that be—which occasionally involved blocking buildings and crashing events with megaphones—while others sharply condemned the protesters’ disruptions. The student strike caused the tuition hikes to become a hotly debated issue. Although somewhat regretful, Matak says she’s proud of how she managed to create dialogue on the issue of education and austerity. “Stopping the ‘business as usual’ [mentality] that was happening on campus, being present at classes and literally stopping the [non-striking students] from doing what they wanted to be doing forced a dialogue about a subject that lots of people hadn’t been thinking about,” she said. At one point her “general enthusiasm for stirring the pot” even got her issuing a fake press release on “Concordia’s new commitment to free education” that was picked up by the 24h newspaper as a real story. Matak’s actions may not have been as benign as most other protesters, but they received attention, which was enough to spark change. Throughout the night, other activists on the panel echoed Matak’s belief that disruption is a necessary ingredient to provoke change. “You need to be radical and provocative to get people’s attention,” said panellist Laith Marouf. “You need to be radical and provocative to get people’s attention,” said Marouf, a key figure in covering the student strikes during his time at CUTV. Rodney John, a black student protester in the 60s who was involved in the computer uprising, recounts how ingrained racism was at Concordia leading up to the event. Another issue at Concordia was an exclusivity agreement between the food service company Sodexo-Marriott (now called Sodexo) and the university that effectively made it illegal to have bake sales on campus. This, along with the lack of a prayer space for Muslim students, was fought against in 2001 by speakers on the panel, including Robert Green, who was the CSU president during the controversy. Bernans, another panelist who is currently the vice-president of the Syndicat des professionnelles et professionnels du gouvernement du Québec, took part in a three day strike against a $360 student fee hike during a tuition freeze that caused the university back down afterwards. Many of the speakers at the event suffered grave consequences for some of the things they did during their time at Concordia. Engler, the CSU’s VP Communications in 2002, shared that on one occasion the university administration used police intervention to reprimand him for distributing leaflets on the main floor of the Hall Building, an activity which had been banned at that location since the Netanyahu incident. “They sent 19 police cars to arrest one elected official,” said Engler of the event. Most others on the panel have been suspended, but all repeated throughout the talk that their actions were worth the setbacks. “That risk of being expelled from the university is nothing compared to the risk of a Palestinian student grabbing a rock and throwing it at an Israeli soldier,” said Marouf boldly, sounding like the same Concordia protester from a decade ago.